This ultra-gentle nutrient-rich, cleansing mixture of herbs, flowers and grain powders, is based on a well-researched, classical Ayurvedic recipe to cleanse, nourish, and purify the baby's skin. 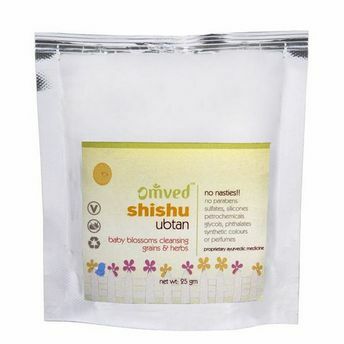 This ubtan can be also used in place of a soap for your baby's tender skin. This daily nourishing bath powder is formulated with botanicals, scientifically proven for their medicinal benefits to skin & health. Cooling white Sandalwood and Aromatic Rose petals that refreshes the skin Keep your baby clean, fresh and irresistibly sweet smelling. Omved Shishu Ubtan is a super fine blend of botanical assured safe and nourishing for baby's tender skin.